In 1935, Brother Marie-Victorin urged the mayor to give the city a botanical garden. As a Brother of the Christian Schools and a botanist, he dreamed of a garden that was beautiful, educational and inspiring. Today’s Botanical Garden has achieved his vision, and is now considered to be one of the world’s great botanical gardens. The Botanical Garden contains 10 greenhouses and 30 thematic gardens which also provide fascinating windows into the world’s many cultures. The gardens span 185 acres (75 hectares), so wear comfortable shoes. Walk through one of the largest Chinese gardens outside of China, and less typical ones, like the First Nations and Toxic Plants gardens. Explore the extensive Arboretum, which is the largest part of the garden and contains about 7,000 trees and shrubs. The best time to visit is in the fall when the leaves explode into color, but visitors also come during the winter for cross-country skiing. In summer partake in a tea ceremony in the Japanese Garden or finish the day with a cocktail and live music on the terrace. Don’t miss the Insectarium which features over 160,000 insects. If your time is limited, or you’re not sure which gardens you’d like to see, hop on the free trolley bus for a great overview of the garden. While the warmer months are the best time to see the outdoor sections of the garden, all 10 of the garden’s greenhouses and the Insectarium remain open year-round. The price of admission gives you access to all of the gardens and greenhouses, as well as the Insectarium. Located just a few minutes northeast of Downtown in Maisonneuve Park, the Montreal Botanical Garden is easily accessible by metro or bus. Paid parking is available. The Biodome, with zoo, aquarium and nature preserve, is just across the Rue Sherbrooke behind the Olympic Stadium. Visit both for a lovely day enjoying Montreal’s plant and animal life. 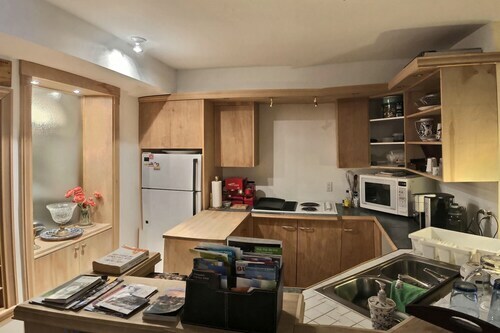 Located in Hochelaga-Maisonneuve, this bed & breakfast is within a 10-minute walk of Olympic Stadium and Montreal Biodome. Montreal Botanical Garden and Sainte-Catherine Street are also within 3 mi (5 km). Pie IX Station is only a 3-minute walk and Viau Station is 11 minutes. 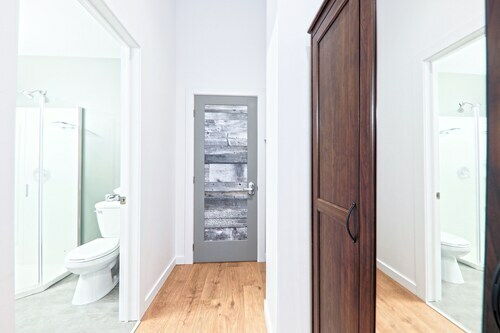 Situated in Montreal, this property is within a 10-minute walk of Olympic Stadium, Montreal Biodome, and Montreal Botanical Garden. Sainte-Catherine Street is 3 mi (4.8 km) away. Pie IX Station is only a 4-minute walk and Viau Station is 8 minutes. 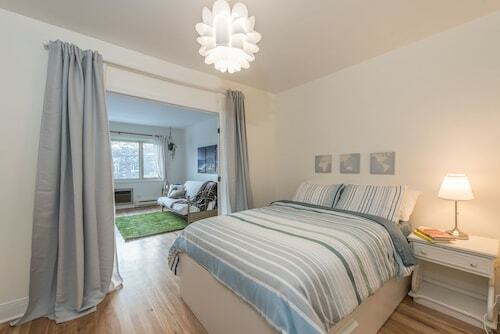 Situated in Montreal, this property is within a 5-minute walk of Montreal Biodome and Olympic Stadium. Montreal Botanical Garden and Sainte-Catherine Street are also within 3 mi (5 km). Viau Station is 6 minutes by foot and Pie IX Station is 7 minutes. 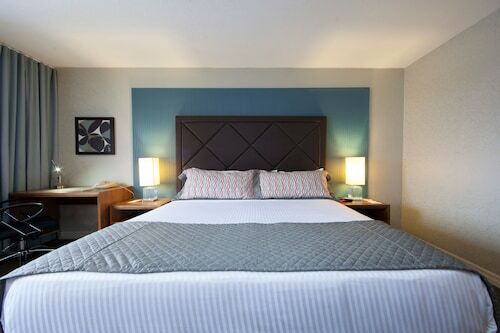 Located in Hochelaga-Maisonneuve, this golf bed & breakfast is within 1 mi (2 km) of Olympic Park, Montreal Botanical Garden, and Olympic Stadium. Montreal Biodome and Sainte-Catherine Street are also within 3 mi (5 km). Joliette Station is only a 3-minute walk and Prefontaine Station is 10 minutes. 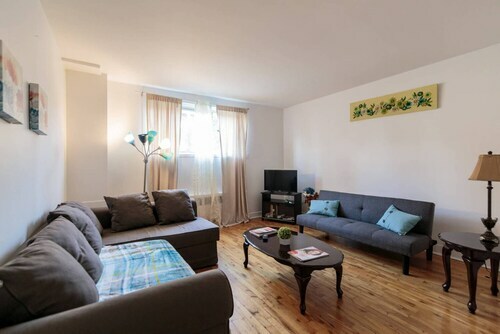 Located in Hochelaga-Maisonneuve, this property is within 1 mi (2 km) of Olympic Park, Montreal Botanical Garden, and Olympic Stadium. Montreal Biodome and Sainte-Catherine Street are also within 3 mi (5 km). Joliette Station is only a 2-minute walk and Prefontaine Station is 10 minutes. This apartment building is located in Montreal (Hochelaga-Maisonneuve), close to Montreal Biodome, Olympic Stadium, and Montreal Botanical Garden. Also nearby are Olympic Park and Saputo Stadium. 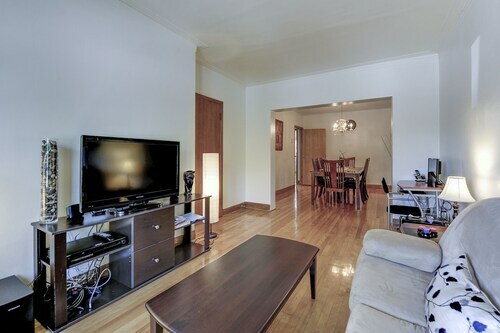 Located in Hochelaga-Maisonneuve, this property is within 2 mi (3 km) of Montreal Botanical Garden, Olympic Stadium, and Montreal Biodome. Sainte-Catherine Street and The Underground City are also within 3 mi (5 km). Joliette Station is only a 3-minute walk and Prefontaine Station is 10 minutes.